"For merely expressing a thought that is not in consonance with the policy of the Government of the day, a person should not be charged under the section", stated the Consultation Paper issued by the Law Commission of India calling for redefinition of sedition, which is made punishable by Section 124A of the Indian Penal Code, 1860. The Consultation Paper solicits public suggestions before the Commission makes final recommendations on the issue. The Commission headed by retired Supreme Court judge Justice Dr.B.S Chauhan noted that in a number of cases, scepticism has been expressed by the judiciary about the potential misuse of the sedition law. It was also observed that sedition is many a times used to stem any sort of political dissent in the country, and also any alternate political philosophy which goes against the ruling party‘s mindset. "In a democracy, singing from the same songbook is not a benchmark of patriotism. People should be at liberty to show their affection towards their country in their own way. For doing the same, one might indulge in constructive criticism or debates, pointing out the loopholes in the policy of the Government. Expressions used in such thoughts might be harsh and unpleasant to some, but that does not render the actions to be branded seditious", said the Commission. Illustratively it was stated that expression of frustration over the state of affairs, for instance, calling India "no country for women‘, or a country that is "racist‘ for its obsession with skin colour as a marker of beauty are critiques that do not threaten‘ the idea of a nation. "In many cases the critique over a failed law expressed through for instance, the burning of Constitution, or expression of disappointment with members of Parliament through a visually disparaging cartoon or an image of Parliament cannot amount to sedition because often the protests may be routed in an idea of India which has been frustrated by its elected representatives, or a law that has demeaned or disappointed citizens of India"
The Commission opined that "Section 124A should be invoked only in cases where the intention behind any act is to disrupt public order or to overthrow the Government with violence and illegal means". (i) The United Kingdom abolished sedition laws ten years back citing that the country did not want to be quoted as an example of using such draconian laws. Given the fact that the section itself was introduced by the British to use as a tool to oppress the Indians, how far it is justified to retain s.124A in IPC? (ii) Should sedition be not redefined in a country like India – the largest democracy of the world, considering that right to free speech and expression is an essential ingredient of democracy ensured as a Fundamental Right by our Constitution? 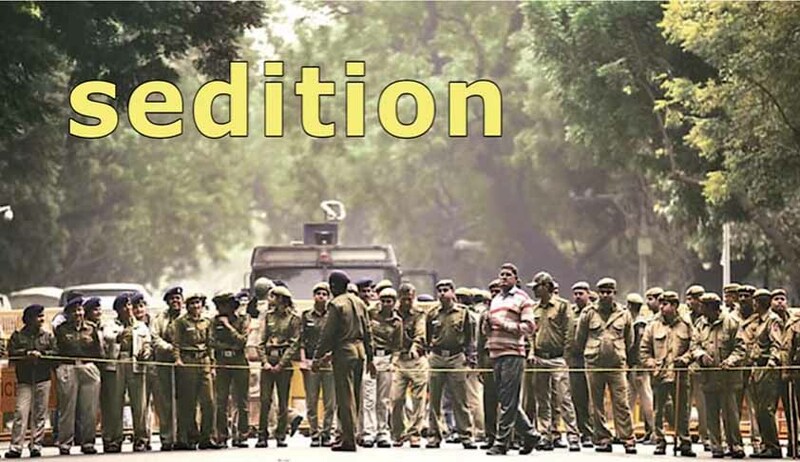 (iii) Will it be worthwhile to think of an option of renaming the section with a suitable substitute for the term "sedition‘ and prescribe punishment accordingly? (iv) What is the extent to which the citizens of our country may enjoy the 'right to offend‘? (v) At what point the 'right to offend' would qualify as hate speech? (vi) How to strike a balance between s.124A and right to freedom of speech and expression? (vii) In view of the fact that there are several statutes which take care of various acts which were earlier considered seditious, how far would keeping section 124A in the IPC, serve any purpose? (viii) Given the fact that all the existing statutes cover the various offences against the individual and / or the offences against the society, will reducing the rigour of s.124A or repealing it be detrimental or beneficial, to the nation? (ix) In a country, where contempt of Court invites penal action, should contempt against the Government established by law not invite punishment? (x) What could be the possible safeguards to ensure that s.124A is not misused? The Consultation Paper also stated that if no room is given for positive criticism of the government, there will be no difference between the pre-independence era and post-independence era. "The Commission hopes a healthy debate will take place among the legal luminaries, lawmakers, Government and non-Government agencies, academia, students and above all, the general public, on the above issues, so that a public friendly amendment could be brought about", stated the Commission.